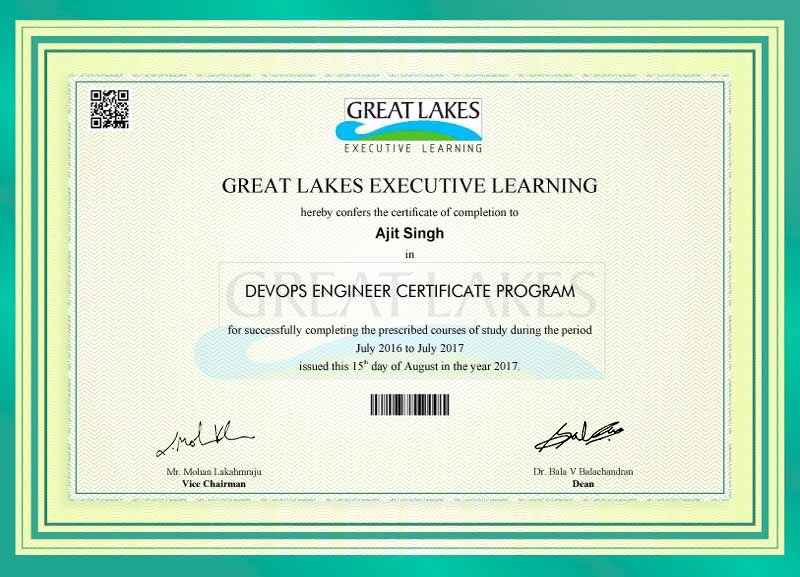 Why Join DevOps Engineer Certificate Program? Learn how to handle the entire DevOps lifecycle right from planning to production. Solve 8 use cases through labs, projects and build your ePortfolio. Learn Git, Jenkins, Ansible, Chef, Puppet, Docker, Maven, Terraform, ELK stack and more. Learn and get weekly mentoring from seasoned industry practitioners experienced in DevOps. Participants attend a live session each weekend to clarify their conceptual doubts, ask questions and discuss use cases with an industry practitioner. Participants can reach out to mentors for queries, career discussions and get capstone project guidance during the program. Earn a Great Lakes certificate and create an ePortfolio to showcase your learning & projects in a snapshot. 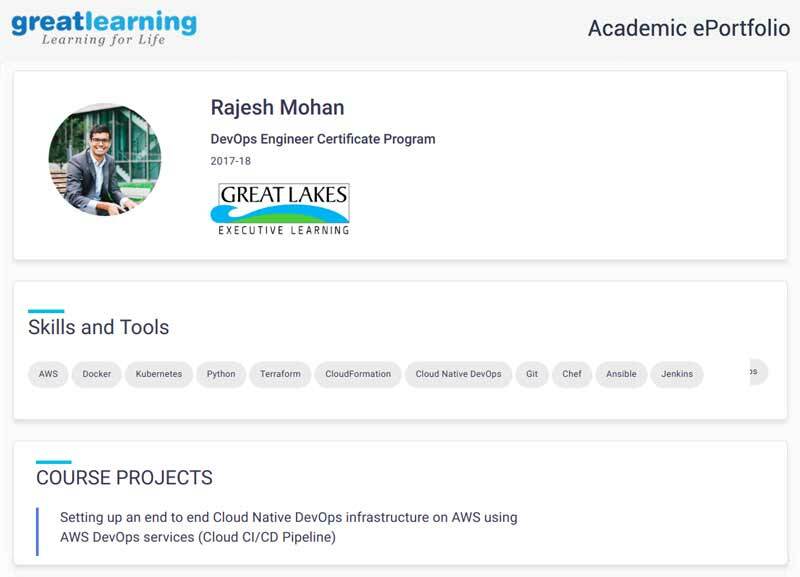 Your certificate and ePortfolio can also be shared on social media channels to establish your credibility in DevOps. done Have a complete understanding of DevOps lifecycle from planning, deployment, and monitoring. done Create new or handle existing DevOps processes and infrastructure. done Understand the difference between Cloud Native and On-premises DevOps. done Automate ops using Infrastructure as Code principles. done Monitor, report, fix and optimize cloud resources. done Understand agile project management and behaviour principles. Apply by filling an Online Application Form. Applicants meeting the eligibility criteria receive a screening call from the Admission Director's office. Admission Director reviews the screening call discussion and applicant’s profile. The announcement of results, followed by the release of admission offer letter. Pay in 12 EMIs at 0% Interest Rate with ZestMoney. Reach out to admission’s office at +91 92056 80226 for more details. Yes. it is a 3-month program offered online with live mentoring sessions on weekends. Candidates should have 1-5 years of experience in a technology role such as Software Developer, Build Engineer, IT Analyst, QA Engineer, Assistant Systems Engineer. There are no technical prerequisites to pursue this program. 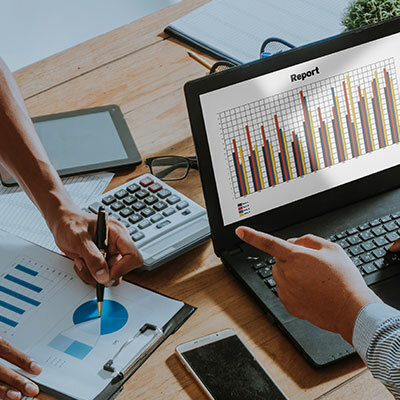 However, prior work experience in one of the many technology roles will highly benefit you and will significantly enhance your learning outcomes. Foundation concepts for Cloud, DevOps, Linux and Python, AWS, Docker, On-Premises DevOps (Git, Jenkins, Chef, Ansible, Puppet, ELK Stack, Packer etc., DevOps on Cloud(AWS), Agile Practices. Please refer to the detailed curriculum here. Who will I learn from (faculty)? The faculty members teaching in this program are industry experts and leaders in their respective expertise areas and have decades of professional experience and wisdom. Renowned experts from academia also participate. Refer to our faculty section for more details. What kind of jobs can I apply for after completing this program? You can apply for multiple roles such as DevOps Engineer, Cloud DevOps Engineer, DevOps Manager etc. You should essentially belong to a technical background to get the best value from the program. What is the extent of hands-on exposure? Are there any live projects? You will solve and implement 6 rigorous labs and 2 fully mentored projects as part of the program. The duration of each project is 4 weeks. Do I get any hard copies in terms of study material? All the requisite learning material is provided online through the Learning Management System. Candidates are free to purchase any reference books or material as may be recommended by the faculty. What kind of career assistance do I get? 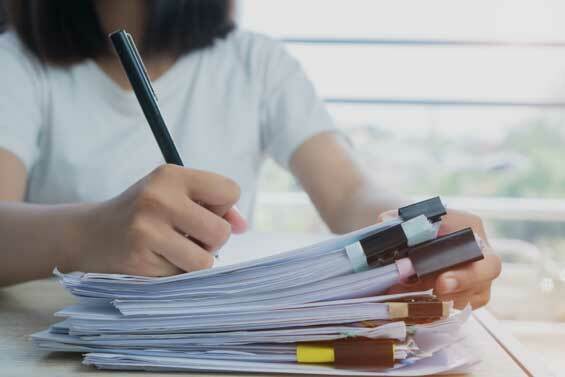 You are provided career support through resume workshops and interview preparation sessions for cloud computing job roles. Relevant career opportunities with leading companies are also shared with you. What is the program fee? Is loan facility available? Please click to see the Program Fee Structure. Admissions office will help you in applying for loans once you receive the offer of admission. Our lending partners include HDFC Credila, Avanse (DHFL), Axis Bank and ZestMoney. We ensure money is not a constraint in the path of learning. All interested candidates are required to apply to the Program by filling up an Online Application Form. Admission Director reviews the screening call discussion and the applicant’s profile. Do I have to attend classes every week? The program is designed to engage participants every week. All participants are required to learn from videos and to attend live mentor sessions every weekend. However, attending lab support hours are optional and you can attend it only in case you need clarify your doubts regarding the lab exercise. What if I miss a project submission? All projects are mandatory evaluation components. If you miss a project, you need to re-enrol into the same course and repeat the project.